Scudamore’s Super Stakes Online Slot Review – 5000x your stake to be won! If you’re a fan of horseracing then Scudamore’s Super Stakes is the slot game for you. In brand partnership with eight-time Champion Jockey, Peter Scudamore, NetEnt brings you authentic action with commentary from Scudamore himself. 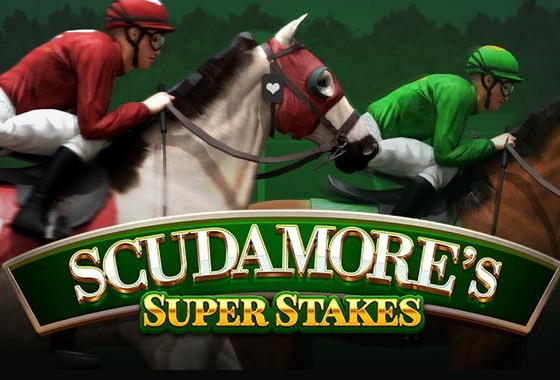 If you’re a fan of the races, we’re talking horseracing to be specific, then Scudamore’s Super Stakes is the slot game for you. In brand partnership with eight-time Champion Jockey, Peter Scudamore, NetEnt brings you authentic action with commentary from Scudamore himself, in this 3-row, 5-reel slot with 32 fixed paylines. The game comes with three in-game benefits: there’s random wilds and a Bet Slip feature where you can win up to 1242x your stake if your chosen symbol appears a certain amount of times in a set number of spins. But, it’s all about the Peter’s Classic Cup feature where, if you pick the winning horse, you could pocket up to 5,000 times your stake! The reels are set on a horseracing course, and the 8 standard symbols include A, K, Q and J royals (low-value) as well as 4 jockeys and their horses (high-value). The red jockey with the white horse is the most lucrative, giving you 12.5 times your stake for 5 across a payline. The wild, featuring Peter Scudamore himself, substitutes for all symbols except the scatter and the Bet Slip symbol. This feature can be set off any time, upon any given spin. When activated, it will provide you with 2 to 5 wild horseshoe symbols placed randomly on the reels, resulting in adjacent positions also turning wild, and more potential wins for you! The Bet Slip will track how many times a symbol appears during a selected number of spins, and will pay the multiplier times your stake value if you get that chosen symbol in the spins decided. If you select the wild symbol and the Random Wild feature applies, it will count towards the Bet Slip. Once you have made your choice, the feature begins. All 4 horses are positioned on the track, and for every winning combo you land, your horse moves one spot on the track. The first horse to cross the finish line takes the trophy (and the winnings if yours!) and ends the feature. Note: While it may be tempting to select Diving Fortune, your chances of winning are statistically higher with Tin Foil Hat! As mentioned, Scudamore’s Super Stakes is an obvious recommendation if you love the sport of horse racing. But even if you don’t, it’s still worth a try. NetEnt has taken an interesting concept and managed to make it work and feel authentic at the same time. The Bet Slip and Classic Cup features are innovative and adds the right amount of thrills, with decent payouts to boot.